Muhammad Shujaat Siddiqi: Hello, this is C# method. Who is Calling me? Hello, this is C# method. Who is Calling me? And there was no easier answer other than going through the stack trace and scanning the frames yourself. Well this is just made easier in Visual Studio 2011 Beta and we will be discussing the same feature today. 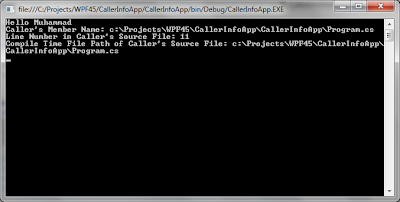 This provides a method details about the caller. It seems that you haven't been involved in chasing and tracing some weird flow in which your code is executed. This has always been a pain for most of us. Sometimes, the only option left is to write a bunch of Trace.WriteLine() with some text to identify the method. Then at the end of usecase, you look at the trace to find out exactly what was the flow of execution of your code. This feature is provided to further support this tracing, debugging and diagnostics. 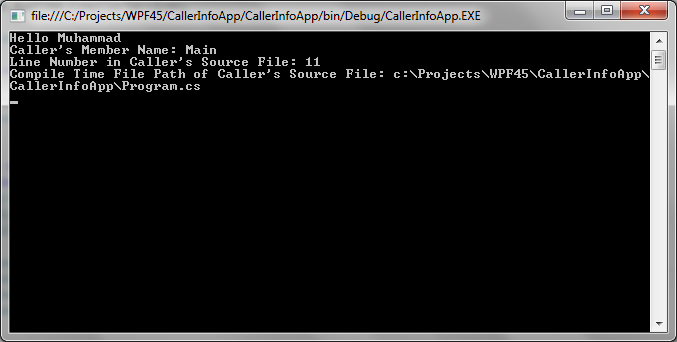 The compile time path of the source file of the caller. The name of member [Property or Method] of the caller. How is this feature supported in the framework? This feature is supported by providing new attributes in System.Runtime.CompilerServices namespace in mscorlib. How can I use them in my C# code? These attributes are targeted for methods. We need to decorate the parameters with any of these attributes and the run-time would populate them with the relevant information as promised. This is built on top of another great C# feature. It is called optional parameters. This would have all the limitations of optional parameter i.e. these parameters must be the last parameters of the methods and they should have some default values assigned based on their types. CallerMemberNameAttribute and CallerFilePathAttribute may be assigned a string value. CallerLineNumberAttribute must be specified with some integer value. 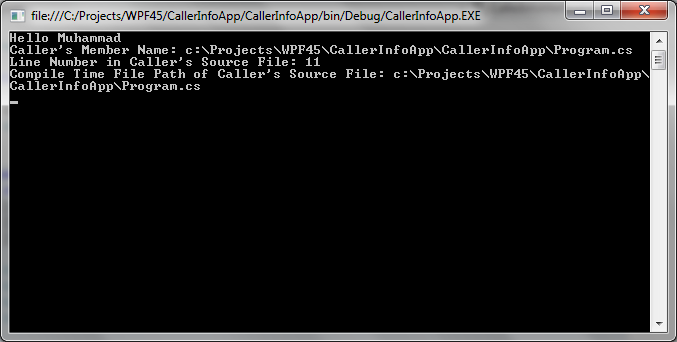 Here we have used all three of the newly available attributes in CallerInfoMethod definition. We are calling the method from within the same class from Main method. Let's run the application and see what it prints on the console. Can I use more than One Attribute for a Parmeter? The classes in System.Runtime.CompilerServices are for compiler writers' use only. I don't buy to this and clearly we use other things from the namespace too, like when unit testing InternalsVisibleTo is used very often. I think that it would be better if these new attributes are moved to System.Diagnostics instead. This should keep everyone happy.